Iron On Transfers perfect for tee shirts, but can also be used on other apparel such as onesies, bib, pants, shirts and even on pillows and totes. They can be applied to any fabric that can be ironed at the higher temperatures. We do NOT have minimums! You can buy 1 for that tote bag, 2 for the throw pillows or 30 for your team shirts. You select from one of our designs and customize it to suit your needs or your can create your own from the 1000's of graphic and patterns that we have in our system. If you have your own vector art, we can create the transfer for you. If you don't find what you are looking for, please contact us and we will try best to accommodate you. Our Graphic iron transfers are available in 4 sizes - S, M, L & XL; each size has preset and maximum dimensions, however you can customize the transfer to YOUR EXACT size. 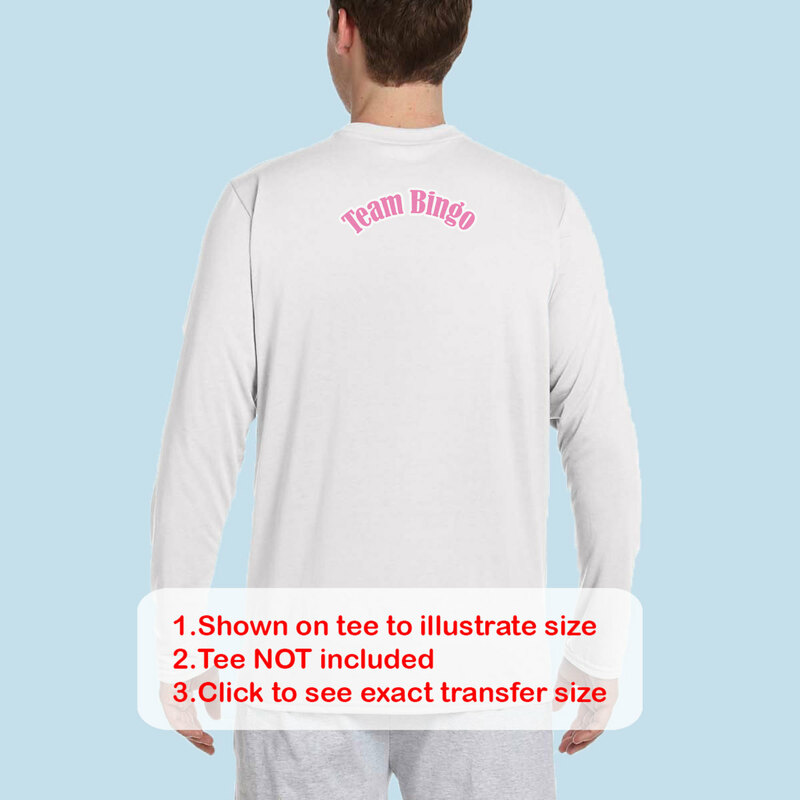 So for example if you are making 5 different sized tee shirts for your family - you can size each transfer to fit the tee shirt - so your XS tee shirt will NOT look like it has an overgrown transfer and your 2XL sized tees shirt will not look like it has a baby sized transfer on it. 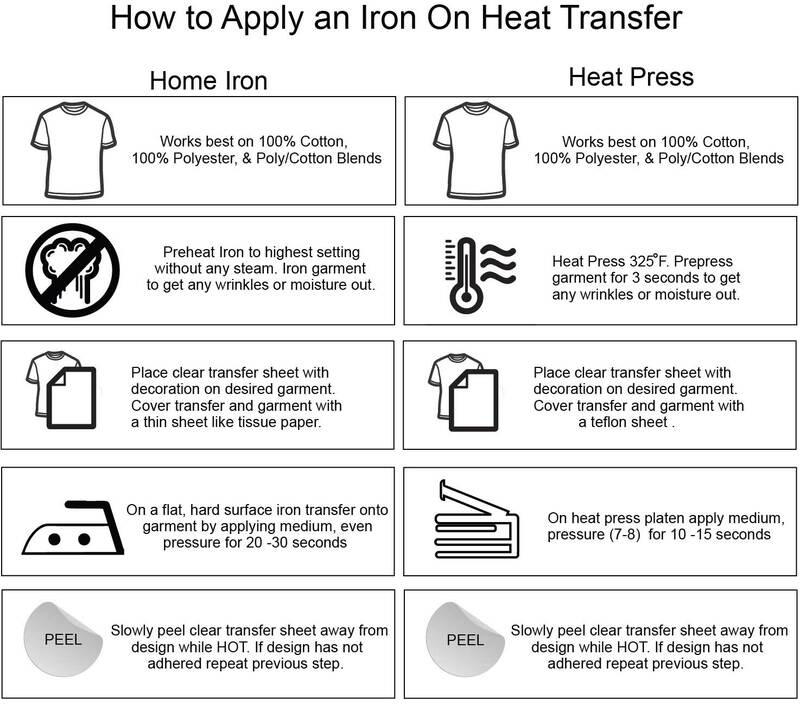 The most important thing when buying iron on transfer is MEASUREMENTS. 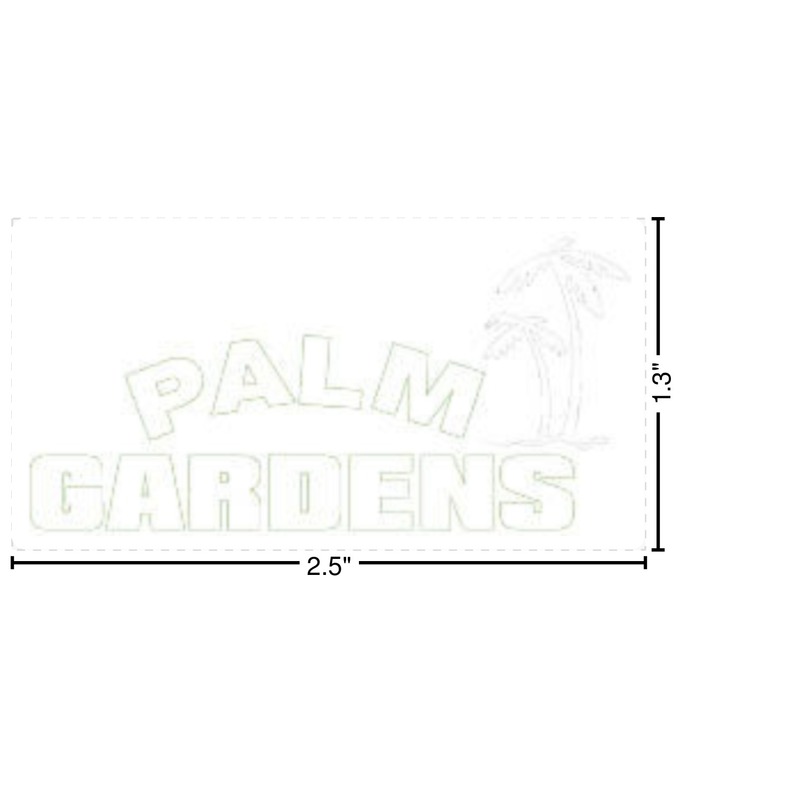 Measure the height and width of area on the items where you will apply the transfer. Use the maximum width as your guide to purchase the transfer. Laying paper in the your dimensions on the item can help you visualize how it will look. Most of our designs contain a graphic and a name because with us personalization is always available to you. You can simply change the text or remove if you prefer just the graphic. The choice is yours! 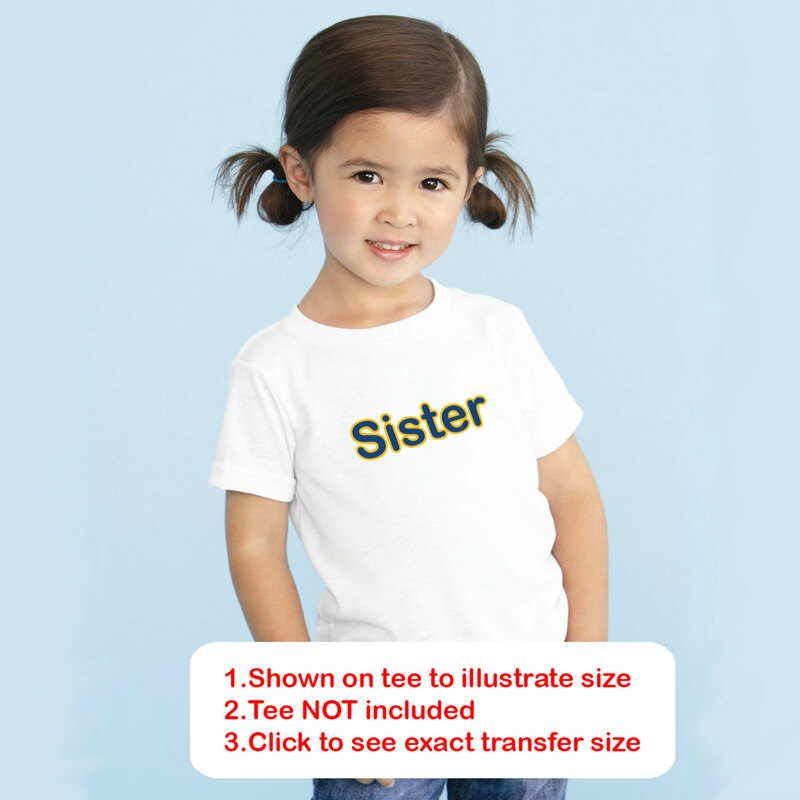 If you are wanting a high details color graphic, we now offer sublimation transfers. Browse our DIY section for heat transfer vinyl sheets and glitter iron on transfers. 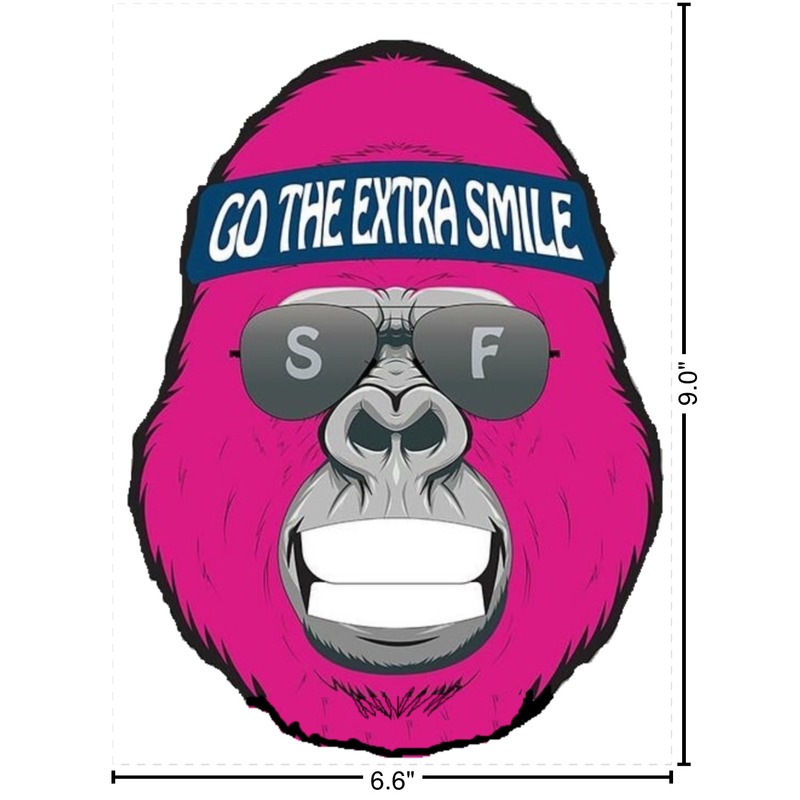 We also have various types of stickers & decals. The Iron on came out exactly how I wanted it and they offered great customer services. They reached out to me and made sure they could alter it so it would work better and to double check on the size (It's small because it's for a toddler's shirt). I recommend them for designing your own iron ons! Ordering was easy, good price, and the shipment was quick. The quality of the iron on is impressive, it looks great, no color bleeds or sloppy lines. Comes with iron-on instructions, hoping the process is just as smooth. I am very happy with the iron on transfer that I ordered and received in a very timely manner. I have applied them to the material I had purchased, but have not completed the project yet. It applied very easily and looks lovely. Thank you. I would definitely recommend your company. 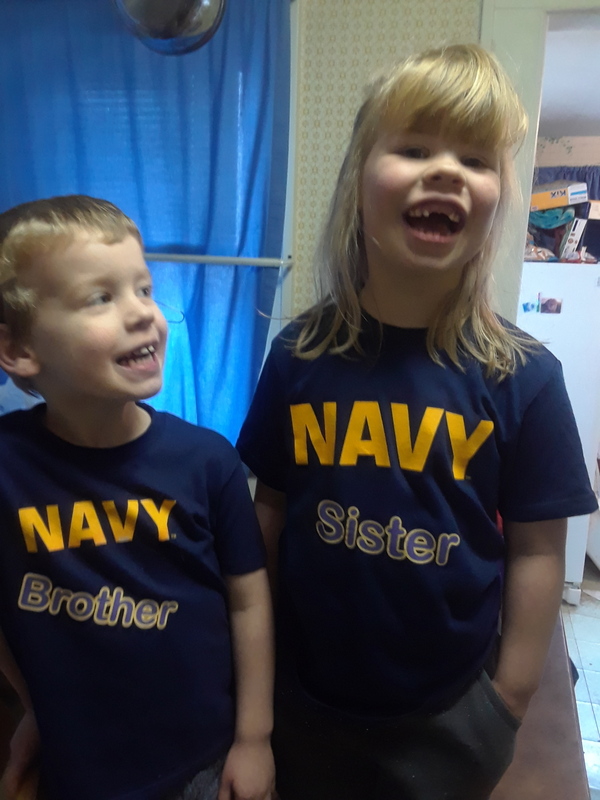 I added these to the littles Navy shirts. I followed the instructions and had no trouble with the transfers. 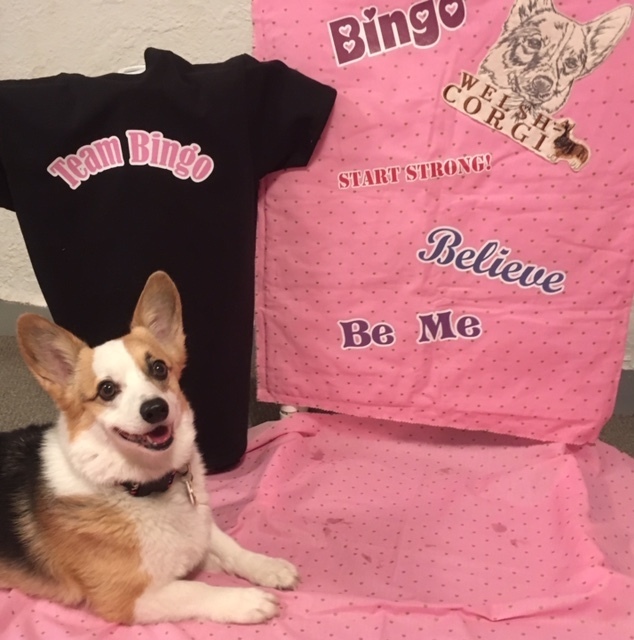 I love all of the custom graphic iron on transfers I ordered for our "Team Bingo" inspirational rally blanket. My dog and I, Bingo compete in canine agility events and it's nice to look at our rally blanket for inspiration before we run a course. Our most recent addition is the "Team Bingo" name I ironed on the back of a fierce looking skull t-shirt I wear at competitions just so everyone knows who we are. 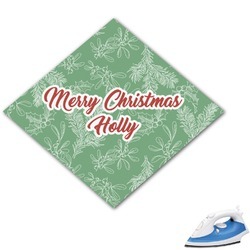 The iron on transfers are easy to design, order and iron on to the project. The price is right too. Thanks so much for making this product available for easy crafting.